What made him a rebel was exactly this – he chose everyday subject matter and elevated it to the size of paintings usually reserved for kings, history, mythology and religion. This was a conscious decision where he equated the realism in his art with political anarchism. Showing a burial of peasants (as pictured below) almost 22 feet wide was scandalous and shocking. Parallel to his carrying on with “vulgar” subject matter in these large sizes, he was an extremely outspoken and political individual. His fingers and toes were planted heavily in the gallery world and in the government’s nose of the time. He fanned the fire of his celebrity by writing essays on democratic and socialist ideas – all politically motivated. Gustave Courbet, A Burial at Ornans, 1849-1850, oil on canvas, (123.6 x 261 inches – ~ 10.5 x 22 feet), Musee d’Orsay, Paris. Exhibition at the 1850–1851 Paris Salon created an “explosive reaction” and brought Courbet instant fame. Before Courbet an artist was simply that – no fanfare, simply an artist/artisan. Remember it wasn’t until Impressionism that people started to marvel at the persona of the artists (i.e. Van Gogh, Cezanne, Gaugain). Courbet bridged the world of the Romantics to the world of Impressionists. Popular belief lands the Impressionists as the troublemakers and rebels. In fact it wasn’t exactly so – Courbet paved the way for new perceptions of art and artists given his assistance on mixing personal politics with painting. Impressionists arguably were more concerned with taste making than he was. Courbet so pitted himself against the system at the time that when the Salon rejected his paintings due to their size and subject, that in 1855 he went ahead and mounted his own gallery space, the “Pavilion of Realism” to showcase his work right across the street from Universal Exhibition going on at the time. Ballsy indeed. This is the first record of an artist-organized show by the way. While I adore his chutzpah, and find his art quite nice I think the only downfall to his path as artist celebrity was an unfortunate seed planted for the myth of the “suffering artist”. With all of his clever system navigation, Courbet also posed to be from the peasant class and self taught to make his work of the “real” subject matter be that much more believable. He was anything but poor, and attended the finest academy of art to study painting. The best achievement of his incredible body of work and life’s practice is his emphasis on the real in art – this emphasis on exploring reality opened the doors to so many artists in the future and today. 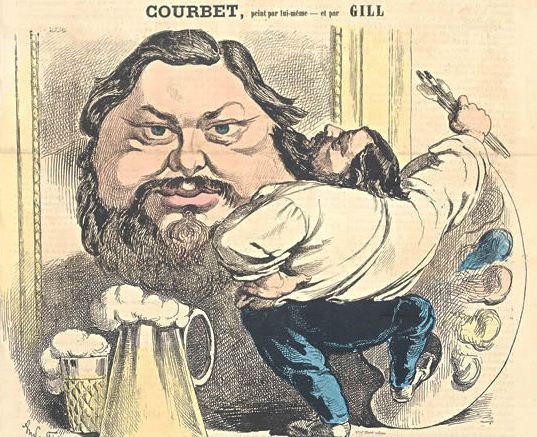 Merci Monsieur Courbet!